In 2016, I took a class covering the historical and cultural influence of the horror genre in cinema. Among the films showed in said class as examples of the various styles to come forth throughout the evolvement the genre was Suspiria, horror maestro Dario Argento’s 1977 splicing of the Giallo filmmaking style (suspenseful mystery thrillers usually predominantly by Italian filmmakers) with elements of the supernatural. 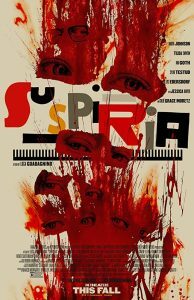 I had previously heard of Suspiria having no knowledge of its plot, but its tagline (“The only thing more terrifying than the last 12 minutes of this film are the first 92”) was enough to catch my interest. I did not, however, find the film, about a young, American dancer (Jessica Harper) who joins a German ballet school not realizing that dark forces are at play behind the curtain, particularly frightening. What I did find it to be was a visual masterpiece with a striking color palette that stays burned in your mind past the credits. A new reimagining of the thriller from Academy Award-nominated filmmaker Luca Guadagnino is less colorful, yet more disturbing and easily more ambitious, not to mention far more confusing. The plot is essentially the same. Filling the shoes of the lead role, Susie Bannion, is Dakota Johnson. Susie is a shy, naïve aspiring ballet dancer, but with a strong determination that catches the eye of head instructor Madame Blanc (Tilda Swinton). Blanc takes her under her wing as her star pupil, but little does Susie know that Blanc has a more insidious agenda in store for her. Meanwhile, it is learned that one of the school’s dancers, Patricia (Chloë Grace Moretz) has mysteriously disappeared. The last person to see her is her psychiatrist, Dr. Josef Klemperer (Lutz Ebersdorf, a pseudonym for… best you find out on your own), who takes it upon himself to figure out the truth behind her absence and if it may have something to do with the dance school she had previously warned him about. The closer he gets to the truth, the more dangerous the situation, beyond his own understanding, turns out to be. This is a remake in more of the same way that Quentin Tarantino’s Inglourious Basterds is a remake of Enzo G. Castellari’s The Inglorious Bastards. It adopts the title, basic plot elements and time setting, but leaves nothing the same. In terms of reinvention, there is plenty that is seen and heard to be admired. Argento’s iconic, visceral aesthetic is tossed out the window in exchange for a more dismal, gothic production design. The aesthetic, when blended with the manic, unconventional cinematography, suggests a replacement of the Giallo filmmaking style, which the original is famous for, for a rebirth of German Expressionism, a style that has rarely been explored since its prime in the early 20th Century. The score by Radiohead’s Thom Yorke, which could be enjoyed without visual accompaniment, creates an interesting juxtaposition to many scenes. When the film is going for exploitative, graphically violent imagery, it is, undoubtedly, tough to swallow, if you can stand to refrain from blinking as they come and go in rapid succession. With as much as I can say that I applaud about Suspiria’s ambitious execution (the callback to German Expressionism being the most refreshing), my admiration for it does not outweigh my annoyance by it. Its stagnant pacing, disorienting inclusion of subplots, incomprehensible dialogue and frustrating overreliance of symbolism was more successful in repelling me than it was in absorbing me. To put it bluntly, I did not get this movie. There seems to be more going on with the film than it willfully wants you to understand. By the end, it feels like a geyser of vaguely accentuated, albeit deeply shocking, buildup with very little narrative payoff. Perhaps a second viewing is in order, but I have no interest in enduring it at the moment. I genuinely wish that this would not have been my concluding statement, but here it is: stick with the original.